It is hard enough to be a congressional staffer, but if you have young children the problem is magnified. Washington, D.C. is the most expensive place in the United States to raise a family, congressional staff work 53 hours-per-week when Congress is in session, and child care options in the nation’s capital can be particularly challenging. Given that Congress already faces significant staff retention problems and three-quarters of its staff find their jobs insufficiently flexible in addressing the work-life balance, is Congress doing enough to support staff in taking care of their youngest family members? The House, Senate, Library of Congress, and Government Accountability Office each have affiliated day care services that provide their staff preferential access, but the spots available are woefully inadequate to meet demand. In addition, the wait lists for infant-care are so long that by the time a position opens up, the average child ages out of infant care. More than 578 children are on the wait lists for child care among them, with the House wait list 250 children deep. The problem is most acute for infants. The child care programs cover children ranging in age from a few months old up to five years old, yet almost half the families on the wait list are seeking care for one-year-olds or younger. One office we contacted suggested that if you want to get your child in, you should get on the wait list the day you find out you’re expecting. 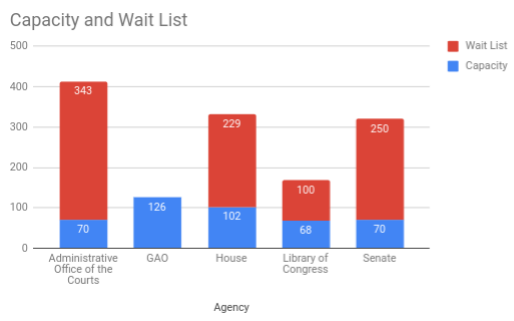 The Government Accountability Office provides day care for young children, and they do a much better job of meeting demand, but its distance from Capitol Hill means it is an inconvenient option. The Administrative Office of Courts also provides day care and is located near the Senate, but they provide preferential access for Judiciary staff, making it less likely that congressional staff could get a spot. The issue of child care has recently come back on the Congressional radar. The Senate is conducting a review of the Senate Employees’ Child Care Center, pursuant to the FY 2019 legislative branch appropriations report. The study will examine the current operating costs of the facility and review personnel processes for hiring and promotions, but more importantly, the study calls for the Architect of the Capitol to evaluate options for expanding the physical capacity of the SECCC. Congressional Child Care Options Are Grossly Inadequate was originally published in Demand Progress on Medium, where people are continuing the conversation by highlighting and responding to this story.